With the 2019 CPBL Opening Day just around the corner, the league finally announced the official schedule for the new season. And as always, it is not in English. Instead of translating the full CPBL season schedule into English and keeping it updated throughout the year, what we will do today is to teach you how to access and read the 2019 CPBL schedule on the official website. So, without further ado, here our English guide on how to read the official CPBL schedule. 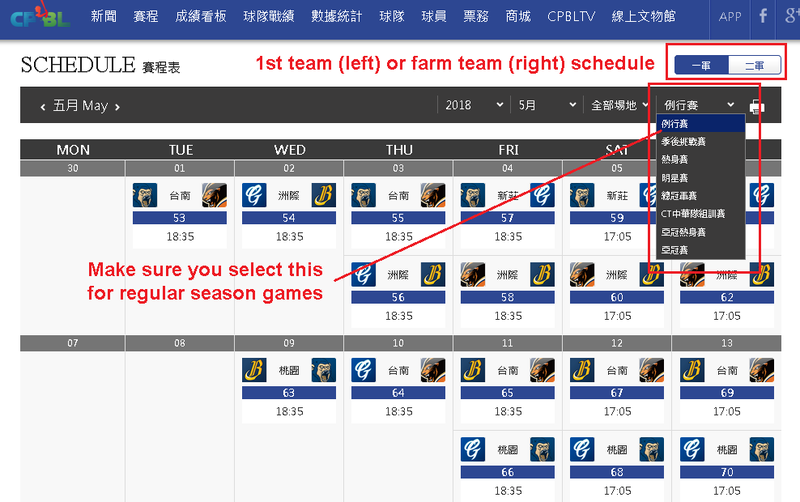 First, visit the official CPBL website and on top left corner click on 賽程 (Schedule) which we highlighted below in red. It will take you to a monthly calendar page. Now, this is probably the most important part. You have to go to the drop down menu and make sure you select 例行賽 (Regular season games). As right now we are still in Spring Training, so the default schedule is set at 熱身賽 (Spring training games). 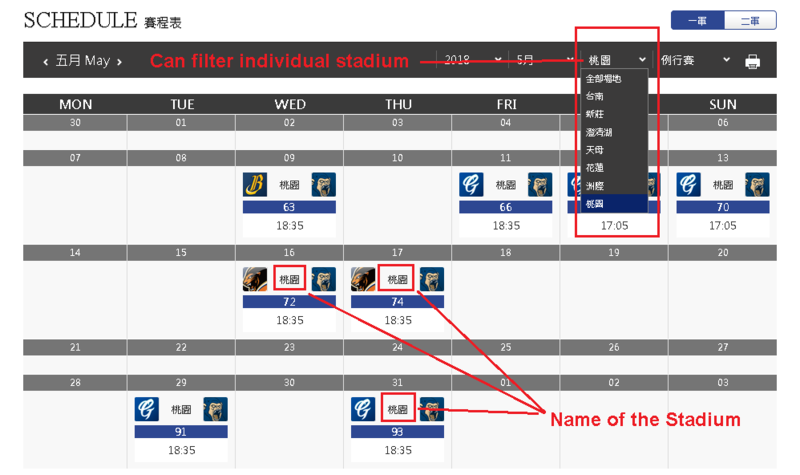 The CPBL official site also comes with an option to filter based on the individual stadium. Click on the drop-down menu in the picture I highlighted below. Below are the translation of the stadiums’ names. 全部場地 (All Stadiums): Set by default. 台南 (Tainan): Mostly used by the Uni-Lions. 新莊 (Xinzhuang): Fully adopted by the Guardians. 澄清湖 (Kaohsiung): Uni-Lions and Brothers play here occasionally. 天母 (Tianmu): Uni-Lions and Brothers play here occasionally. 花蓮 (Hualien): Uni-Lions play here occasionally. 洲際 (Taichung): Mostly used by the Brothers. 桃園 (Taoyuan): Fully adopted by the Monkeys. This is cool. Thanks for the help! Just wondering; is there a guide as to how to buy tickets online coming in the future? Yes, it is work in progress. Guide to buy tickets online is a bit tricky, I can do the guide for the Family Mart online system. But for those iBon ticket machine, might be a bit difficult because they keep changing their interface and layout. My guide will be outdated very quickly. Good job, thanks so much. Extremely helpful as the rest of the website!